For your convenience, the Student Center has pay station and decal lots near the east and south entrances of the Student Center. 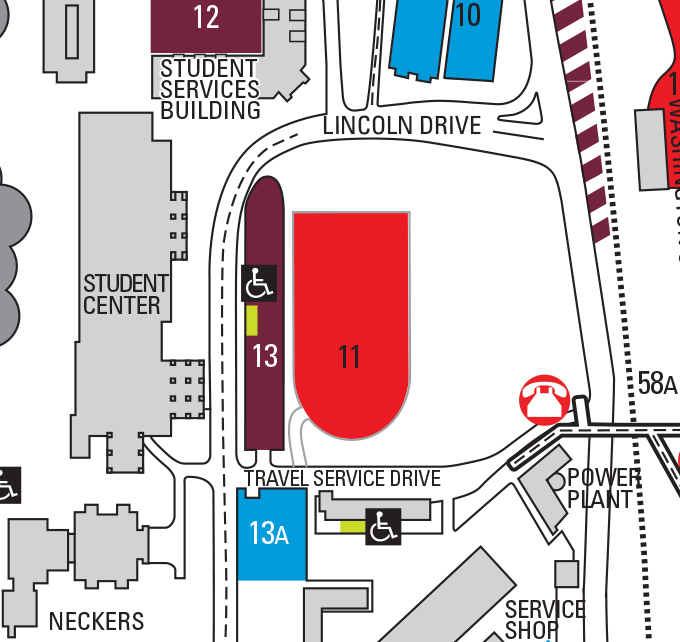 Lot 13 is the pay station lot across Lincoln Drive. The cost is 50 cents/hour with a two hour minimum to park. Visitors as well as faculty, staff and students with decals may park here but everyone must pay. The pay station lot is free to visitors and faculty staff, and students on the weekends starting on Friday at 5:00pm until Monday at 7:00am. Visitors may also park in the decal lots near the Student Center (Lots 11 and 13a) after 4 p.m. and on nights and weekends without a permit. Monday through Friday before 4 p.m., visitors must utilize the pay station or have a guest parking permit. Visitors can purchase a guest parking permit in the Student Center Scheduling Office or at the Parking Division for $4/day. Please note that faculty, staff and students are not considered visitors and must have a decal at all times to park on campus. Premium parking spots are available for rent in the pay station lot for $10/day. Please see the Conference and Scheduling Services Office (618/536-7751) for more information.